A plate condenser is a condenser developed for condensing steam based on an evaporation or distillation system under vacuum conditions. The plate condenser based on the semi-welding technique consists of special plate pack and gaskets. The cooling medium is warmed up in a channel with a gasket, and the steam is condensed in the weld channel. The steam has a large inlet and a small condensate outlet. The plate condenser is primarily used in conjunction with a plate evaporator as a condensation of steam in an evaporation or distillation system. For example, the condensation of steam in the syrup 3-effect evaporation system, the condensation of steam in the juice 3-effect evaporation system, and the condensation of steam in the multi-effect evaporation system of the ethanol concentration in the ethanol industry, and the like. 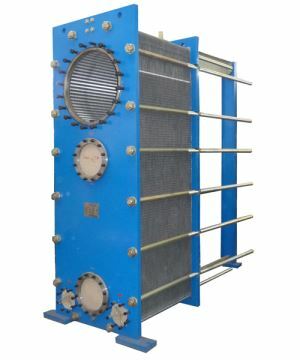 The plate condenser is used in more and more condensation occasions due to its high heat exchange effect, low input cost and convenient maintenance operation. In order to achieve the best condensation effect, our wrench condenser’s plate channel is designed as a wide channel and a narrow channel, with a large channel on the steam side, so that the pressure drop on the steam side becomes very low, and the cooling medium The side has a narrower passage, but still maintains a certain flow rate to achieve turbulence. Therefore, such design makes it with higher heat exchange efficiency and lower fouling coefficient.